Mac Repair Paisley & Glasgow | Top 5 Security Tips to protect your MacBook! Top 5 Security Tips to protect your MacBook! Tip 1- Lock it Up! The best way to keep anyone from walking off with your MacBook is to purchase the Kensington Lock. 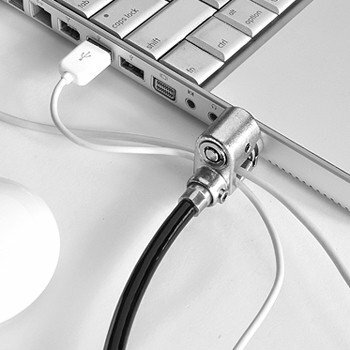 It will secure your MacBook to a desk or table and it will be safe. Tip 2- Set Your Passwords. Set a login password so that when the Mac boots up, you are required to enter a password. It is also a good idea to set a screen saver password so that your computer cannot be accessed when you are away from it. Passwords are a good safety feature but are not completely iron-clad. Tip 3- Encrypt your data. Mac has a built-in encryption tool called “File Vault” that is found in System Preferences. It will encrypt your hard disk and the password is your login password. Another method is to create a dmg file by accessing your disk utilities on your Mac. This is found under Applications-Utilities and there are available tutorials to walk you through it. It is very important that you backup your data daily. This is crucial so that you will not lose your important files and photos. An inexpensive way is with a portable USB drive. You can back up files at anytime to the USB and then keep in a separate location for safety measures. Another great backup tool is by Apple. “The Time Machine” works with an external hard drive and your Mac. It backs up every hour of every day, coping the files that have changed since your last backup. If you delete a file that you meant to keep, you can go back to a previous day that is saved on “Time Machine” and retrieve the file from the past. It would be wise to use both of these methods in case of theft. There are also other backup services available online if you need added security. It is a good idea to add coverage to your household insurance to cover the cost if your computer gets stolen. You should check and see if this option comes with your insurance policy. If not, you may have to purchase a special rider for this. Also, there is protection software available that can remote wipe your hard disk clean and track your computer if stolen. “MacPhoneHome” is just one of several protection software that is available online to choose from.